The Bobcat Chronicle: Award Season! One of the best times of the year is when the recognition and awards start to trickle in - especially after a season of hard work and dedication. It means a great deal to me that our athletes received the acknowledgement they very much deserve. First off is Charlotte Green and Peem Chatikavanij. 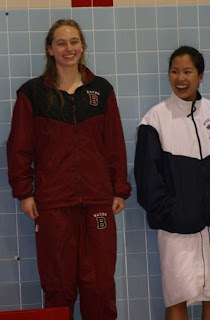 Our two senior captains were voted, by there teammates, onto the All-NESCAC Sportsmanship Team. We've talked at great length as to what it means to demonstrate "good sportsmanship" and below are the bullet points I asked the team to consider when voting. Furthermore, and impressively, this is the third time Peem has won! The next award winners are our All-Academic NESCAC team members! Rules are you have to be varsity team member for a minimum of 2 seasons and have a 3.35 cumulative GPA. Life is all about doing more than one thing well... and the group below are distinguishing themselves both in the pool and the classroom. What an fantastic accomplishment. Congrats Charlotte, Peem and the Smarty Bobcats! 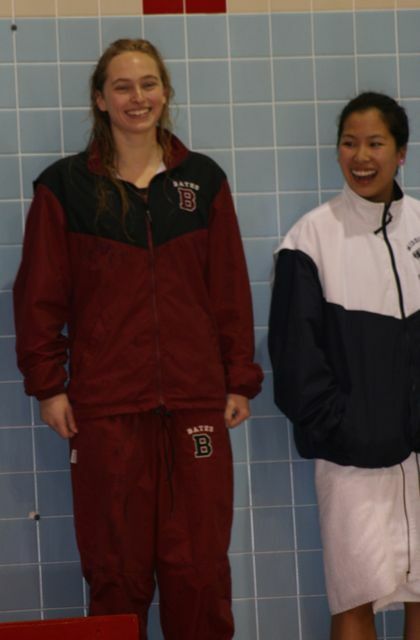 Congrats to all Bobcats on making the Bates Swimming & Diving team Great! All of you should be proud of your accomplishments IN and OUT of the water! Congrats to both seniors. I witnessed first hand their outstanding leadership qualities. ...and congrats to all the other student athletes for their achievement.